Aaron 'Woes' Martin debuted his new Panda King 4 Beast Master for Pow Wow Hawaii a few weeks ago. Inspired by the artist's travels to Mongolia where hunting with golden eagles is a time-honored tradition, the debut hand-painted Monarch Edition was a Hawaii exclusive. Thankfully, after the final tally a small number of the brand-new Panda King are available now from Silent Stage for $499. There are also a limited number of the It's Them giclee prints (Edition of 30 s/n, 12x16", $79.99) available. The champ returns. 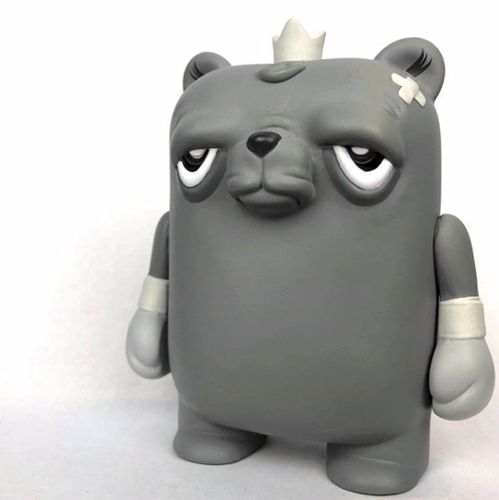 JC Rivera and UVD Toys are set to ring the bell with The Bearchamp Mono edition. 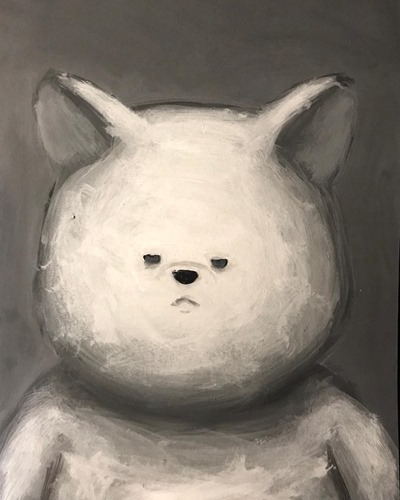 Embracing the grayscale, the newest edition of the Chicago-based artist's signature character blends three similar muted tones along with black and white for a subdued yet sharp look. 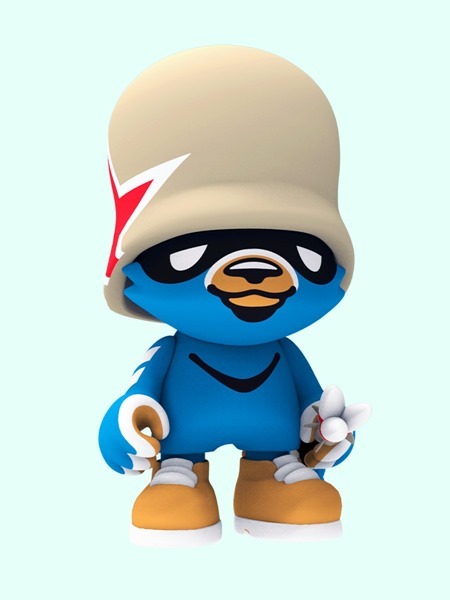 The Bearchamp Mono edition (4") vinyl art toy will be released on Friday (3.1) at 10 AM PST directly from JC Rivera's web shop for $50 each. Amanda Visell's art is filled with charming, unexpected characters, brightening your days and illuminating your nights. She's just released new editions of two of her popular creations. 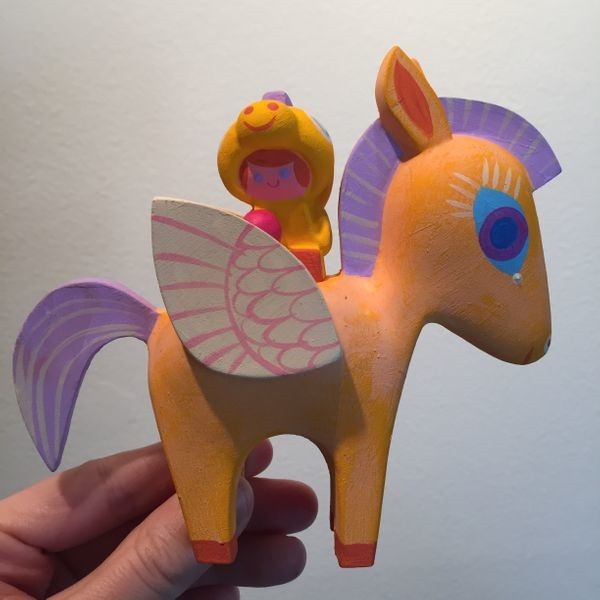 For morning types, there's Sunrise Poopasus (4.5") and girl rider basking in yellow and purple. On the flip side of the clock comes Midnight Llama (6.5") and mushroom friend bathed in blue and purple. Both resin sets are editions of ten and are available now directly from Switcheroo for $90 each. Superplastic has announced the new Jankyförtress Superjanky (8") from german graffiti legend Flying Förtress. Essentially a blue colorway of the previously released Jankytrooper (red), Jankyförtress takes its design cues from the artist's signature Teddy Troop character from the helmet with star and the bear face to the Timberland style shoes. Limited to 300 pieces (compared to 400 for the Jankytrooper), the Jankyförtress Superjanky is available now for pre-order from Superplastic for $75. As with the Jankytrooper, the new edition is slated to ship out in Spring of 2019. Art toy versions of traditional Japanese culture have been popular for some time. Witness the numerous stylized Maneki-neko (Lucky Cat) vinyl toys including Juce Gace's Maneki-Dino inspired by arguably the most popular platform game ever. 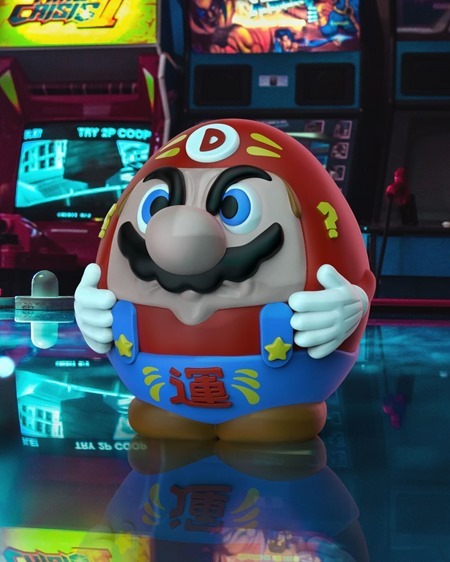 Now Gace takes the slightly less travelled route with his new Darumario figure, an 8-bit fusion of the ever popular plumber and the traditional Daruma doll. While the concept may seem non-obvious, Gace has taken the Daruma shape as a platform of sorts and adapted the video game star's features accordingly. Darumario will be available for pre-order on Saturday (3.2) at 6 AM PST for $129 direct from Mighty Jaxx. 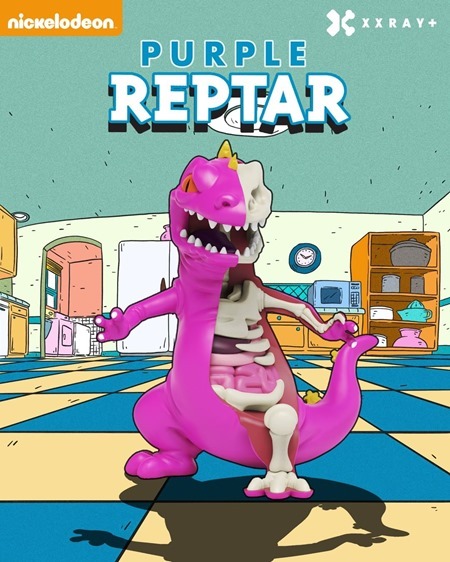 From the fantastic anatomical vision of Jason Freeny comes a new take on the mighty Reptar from Nickelodeon's Rugrats. First seen in the classic green FYE Exclusive, the Mighty Jaxx Exclusive XXRAY Plus Purple Reptar vinyl (10") is available now for pre-order for $129 (worldwide shipping include) direct from MightyJaxx.com. The figure features a stylized pose which offers a bit of a twist on the standard straight-ahead dissected view. Invite him home, but just don't call him 'Dino'. After a lengthy, complex four year production journey, the new Stella and Flux sofubi from Tara McPherson and Tomenosuke + Circus Posterus is done and set to drop this week. If you were lucky enough to see the painted proto at DesignerCon you know these are gorgeous. The paint is extremely well done and brings McPhersons mystical, magical duo to life. The debut Stella and Flux Infrared Edition is limited to 100 pieces and will be released in two separate drops. For North American collectors, Circus Posterus will release 50 pieces on Thursday (2.28) at 12 PM PST for $175 each from their web shop. For those not in North America, Tomenosuke will release 50 pieces on Thursday (2.28) at 11:59 PM JST for ¥19,800 from their web shop. 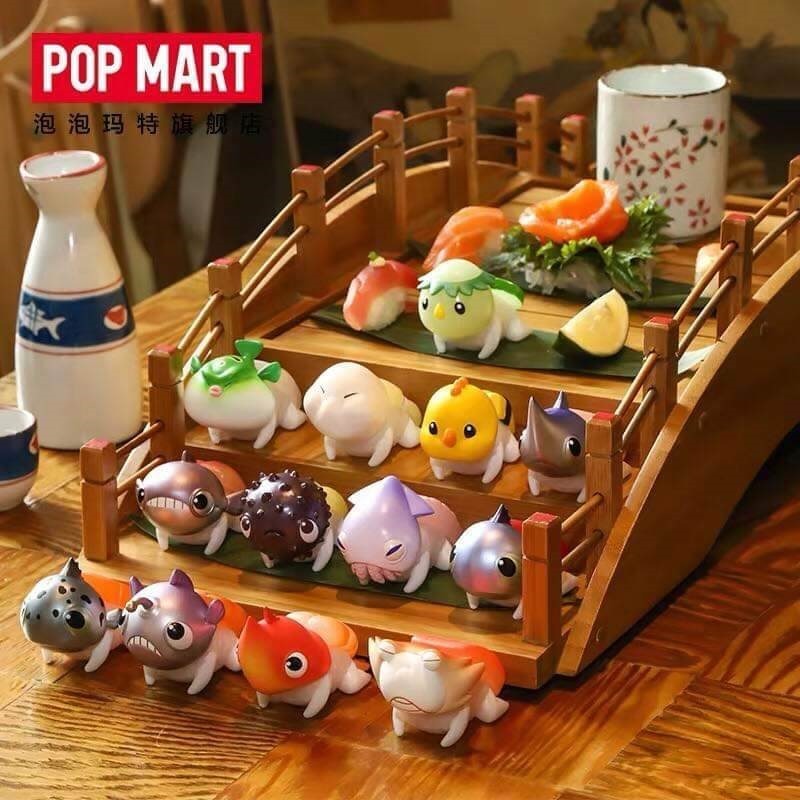 Riffing off his popular Maguro Senpai figure, Chino Lam has designed the new Baby Sushi Mini Series for Pop Mart. Featuring 12 standard designs + at least one chase, the new minis are inspired by Nigiri sushi and feature rice bodies topped with raw seafood (or egg) and cute animal heads that match the topping. So the Ebi (shrimp) design features a shrimp head while the Tamago (egg) features a chicken head. And yes, there's a Maguro (tuna) figure. The Baby Sushi Mini series is available for pre-order from select retailers in the USA including myplasticheart ($10.99). Pop Mart will be offering the series directly through its retail stores in China. The Baby Sushi Mini Series is the latest artist series Mini from blind-box specialists Pop Mart. We hear there are several more artist series in the works. Mr. Clement has released four new Lapin sculptures in porcelain for pre-order via his site. 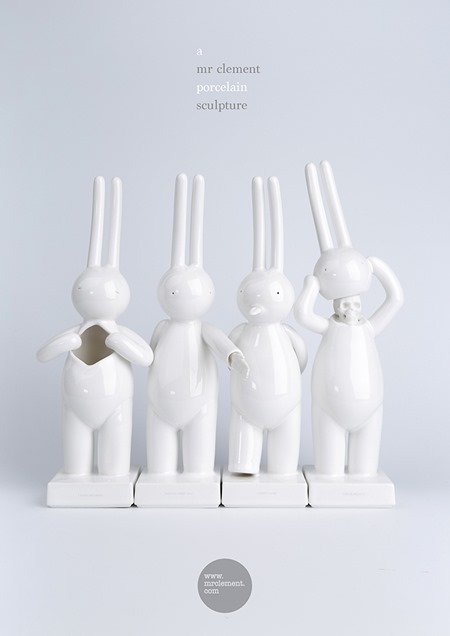 Editions of 50, Each of the 11.41" sculptures offers a different emotive take on the artist's signature rabbit character. I Hide Nothing, I Don't Care, Nice to Meet You, and Inner Beauty are the latest evolution of the artist's 3D work from vinyl to resin to porcelain. The four sculptures are available individually for £185 (~$242) or as set of four for £700 (~$914). Prices include worldwide shipping. 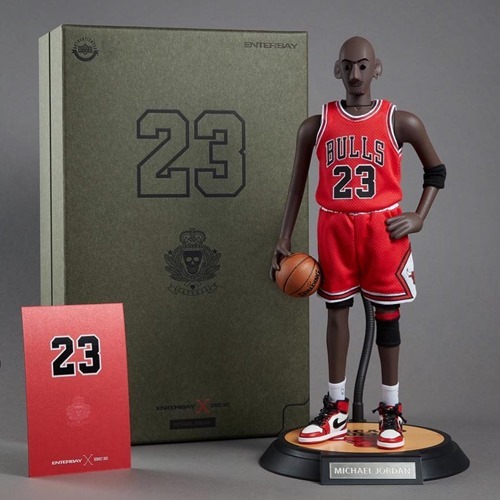 Just a few days since the first teaser shot, Enterbay is now taking pre-orders for its first collaboration with HK urban vinyl pioneer Eric So: the 1/6 Michael Jordan (away) soft vinyl figure. The figure brings Eric So's vision of the legendary NBA player to life with a stylized sculpt from head to toe. The premium figure includes a Chicago Bulls (Away Jersey) with shorts, hand-crafted Air Jordan One shoes, a magnetic right hand that allows the figure to hold the Spalding basketball accessory, a figure stand featuring a wood court design with the Bulls logo, and the other basketball gear apparel show in the pictures. Next to Eric So's signature figure design, the shoes will likely be a key highlight with tremendous detail. Finally, the numerous official licenses including Jordan, NBA, Spalding and Nike should be compelling for detail conscious collectors. Limited to 2000 pieces, The Enterbay x Eric So Michael Jordan (away) figure is available for pre-order for $299 directly from Enterbay. The figure is expected to ship in Q2 2019. Without any fanfare or hype campaign, Lunartik has released his new Graffi'Tea Minis. This spray paint-inspired riff on his signature Lunartik in a Cup of Tea design features spray-cap heads and bursts of a single vibrant color (blue, green, orange") on an otherwise all-white design. 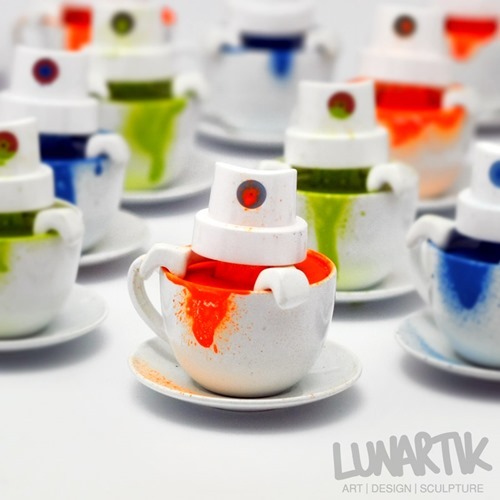 Limited to 30 signed/numbered pieces, The Graffi'Tea Minis are available now for £30 (~$39) from the Lunartik web store. 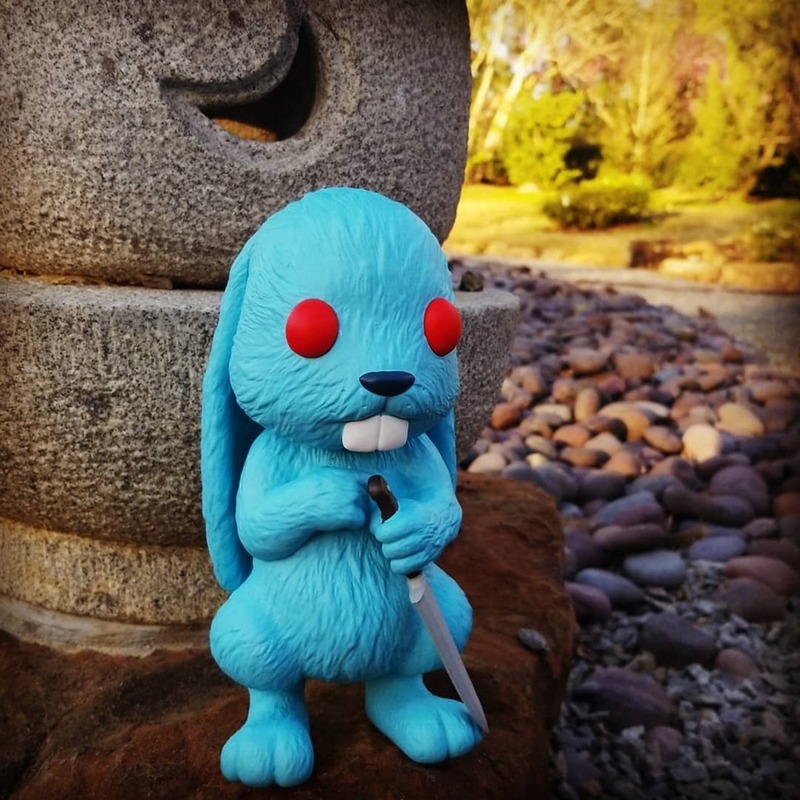 Kidrobot has revealed their new Boneyard Resurrectionist GID 5" Dunny resin figure created by Kyle Kirwan and produced by Clutter Studios. A variant of the OG green version released by Clutter back in November, this new version is cast in gossamer white + dark brown resin and glows a brilliant green. 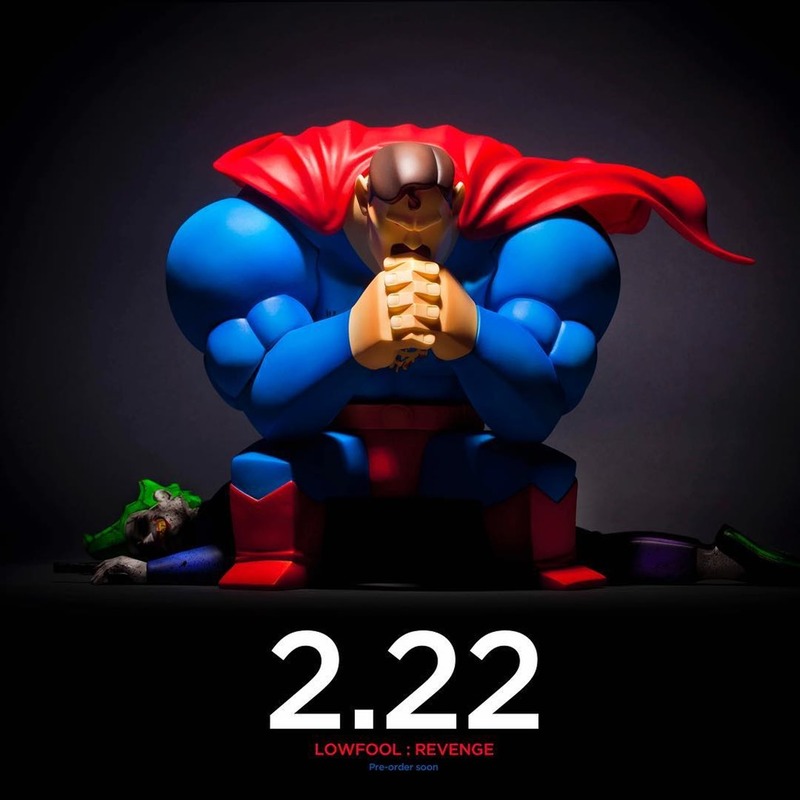 Limited to 100 pieces, this striking piece will be available from Kidrobot.com at 9 AM PST today (2.22). From Amanda Visell, comes the latest in a long line of gnomes. The wise (and old) Storyteller Gnome is apparently as adept chopping as he is telling tall tales. His prodigious beard is a mark of his longevity and creativity. 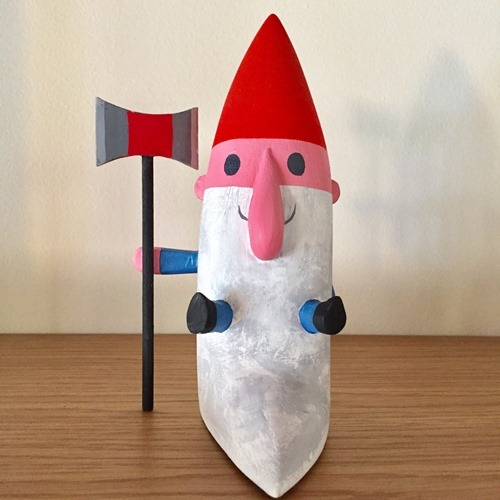 Limited to 25 pieces, the cute and humorous 7.5" Storyteller Gnome resins are available now from Switcheroo for $145 and should ship out within 2-3 weeks. The new Telegrinnies Sunflowers from Dopeness Art Lab x Ron English x Made by Monsters anticipate the coming arrival of Spring. The latest version of English's Sunflowers add the Telegrinnies DNA into the mix for a blossoming hybrid growth. 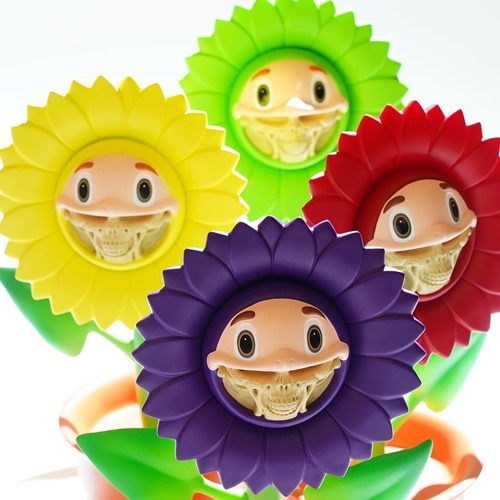 Milk Magazine will release the Telegrinnies Sunflowers on Thursday (2.21) at 6 AM PST from their Milk Cargo online shop. They will be available in pairs—green+yellow and red+ purple—for $1300 per pair. Since these will likely be in high demand we'd recommend creating a Milk Cargo account ahead of time. Stay sharp! Choices Series 2 kicked off last November with the FYE Storm Exclusive, but until yesterday no news of additional drops. In back to back announcements, Jermaine Rogers has announced the Moonlight edition (blue) and the Sunlight edition (white w/brown nose). Both versions of the fateful hare are said to be coming 'soon'. Which to choose? Perhaps both. Buff Monster is set to launch his brand-new Heavy Cream Zine. The full-size (8.5 x 11"), full-color, printed in the USA publication brings you the latest from the master of pink from new drawings created for this project as well as behind-the-scenes process pics. At 88 pages long, Heavy Cream delivers a deep, heavy visual impact and is also quite literally, a heavy volume. In addition to the standard edition, Buff Monster has created a signed/numbered Deluxe Edition (40 pcs) of the zine featuring hand-painted and hand-silkscreened front and back covers. 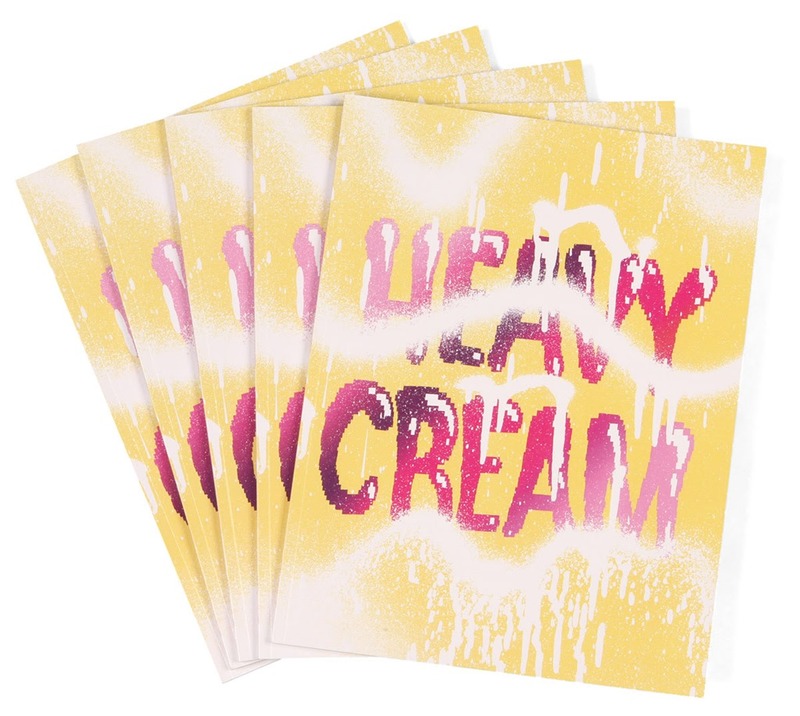 Heavy Cream will be available on Friday (2.22) at 7 AM EST in the standard edition for $20 (+ s/h) and the Deluxe Edition for $120 (+ s/h) from StayMelty. 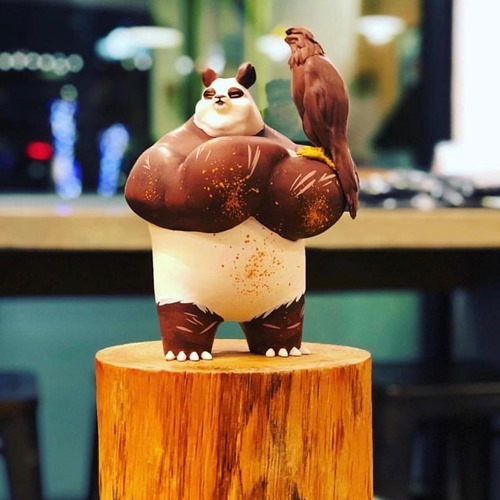 adFunture and Beijing artist Law Sun-Yeung are launching the new Space Woody : The Wanderers micro run. 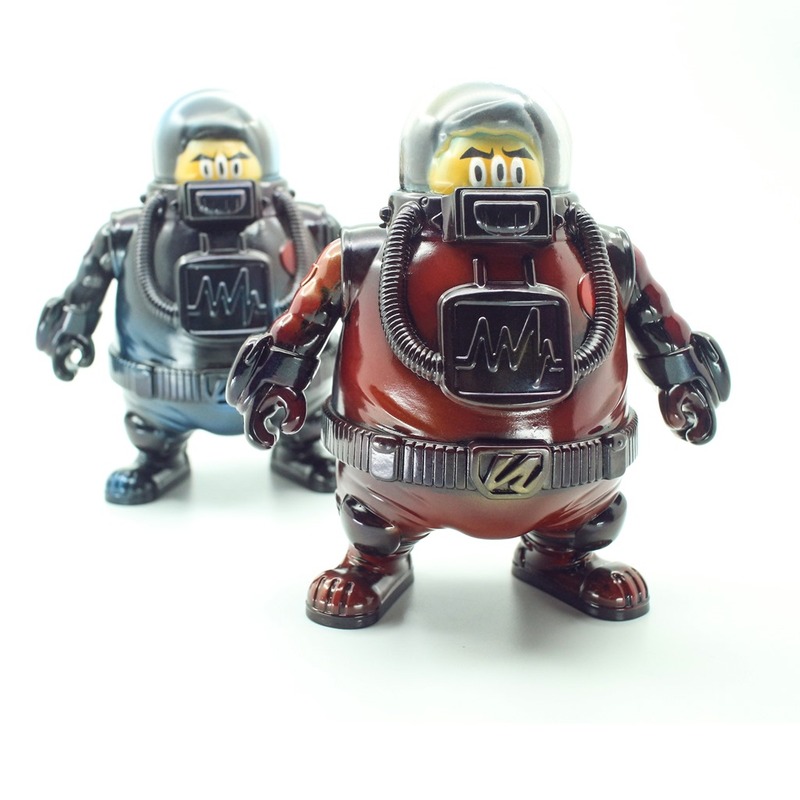 Inspired by a recent sci-fi movie, Law Sun-Yeung has created two new editions of his three-eyed, slightly out-of-shape space explorer in Crimson and Black colorways, matching the suits in the film. Both designs feature metallic paint details to complete the cinematic look. The Wanderers will be released as a timed edition in both Black and Crimson soft vinyl colorways (6.5"_ available for one week (2.22 - 2.29) direct from the adFunture shop for $100 each. These are expected to ship out in March. If you missed the new Stabby vinyl from Craola at DesignerCon, 3DRetro will be releasing it today (2.20) at 12 PM PST from their web shop for $50. The fun figure features the artist's popular retro 'toon stiletto character. 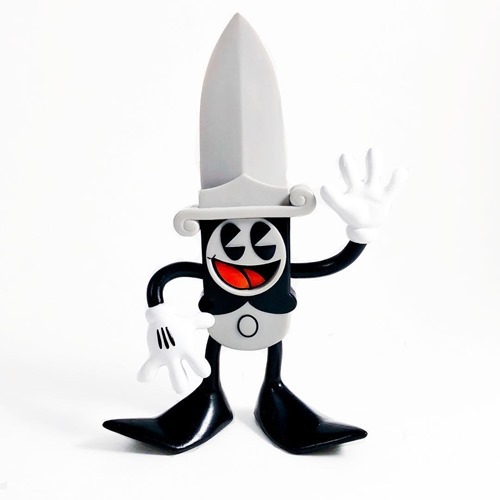 Don't cross Stabby, he's mighty sharp. Tara Mcpherson is offering her Pink Astra and Orbit AP sets featuring signed APs of the vinyl figures + a signed Astra and Orbit print (8" x 11") for $150 from her web shop. This is the first time the artist has offered her AP versions of the rare Pink + Gold Astra and Orbit figures from Kidrobot, first released at NYCC 2018. 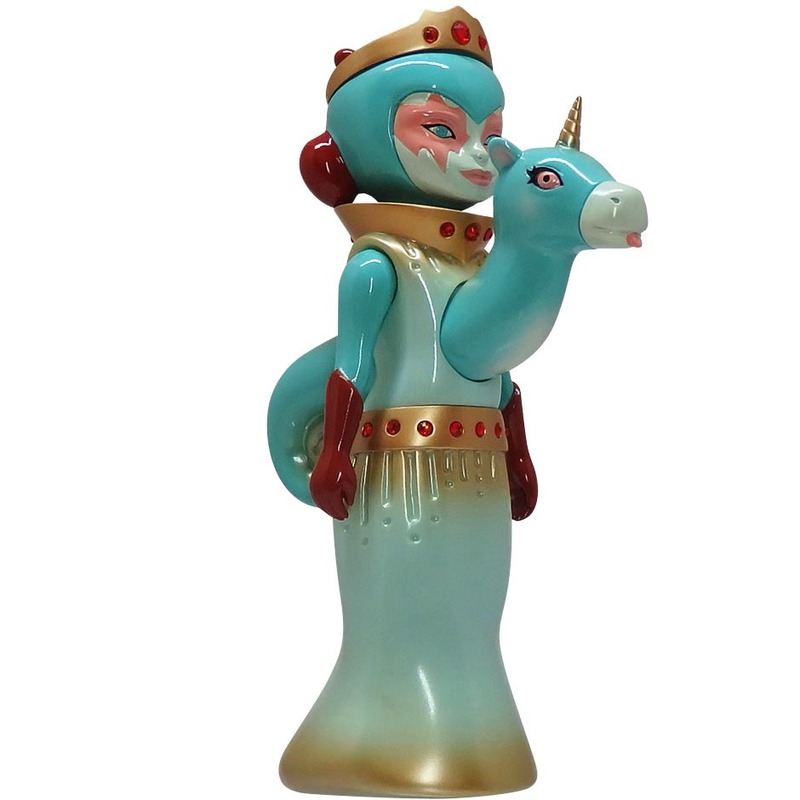 The set features cosmic traveler Astra and her loyal wolf companion, Orbit, from the artist's Dreamwell universe. The Smidgens are back in a brand-new GID edition. Chris Ryniak will release the GID Smidgens ($18) as part of tonight's release (2.20) at 6 PM PST from his web shop. 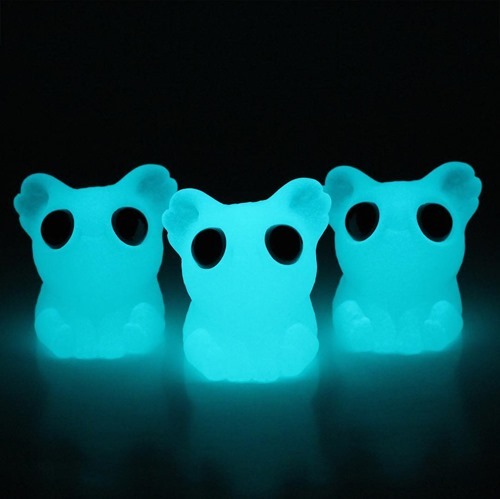 As seen in the pic above, these little guys glow a nice aqua shade rather than the traditional green. Hit the jump for pics in normal lighting and under a black light—all the rage these days. If you're late to the Smidgens party, Ryniak will also be dropping a small quantity of special 'Instant Collection' sets featuring either three (blue, orange black) or four Smidgens (+ GID). This is the perfect way to grow your collection quickly. Luke Chueh will open his new solo, Between Black and White, at Rotofugi Gallery in Chicago on Saturday, March 2nd 2019 (7-10 PM). The show features a new collection of paintings on watercolor paper done in… black and white. 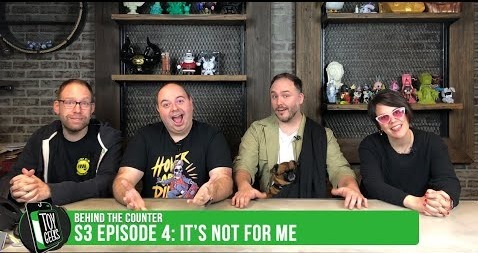 From the pieces Luke has posted on IG and the ones he shared on a recent episode of Toy Geeks: Behind the Counter, Chicago is in for a compelling show. Expect novel visions of his bears, Luke's new look rabbits—representing the business side of his world—and more. Luke will be signing at the show from 7 to 8:30 PM. Hit the jump for a preview of the new paintings. 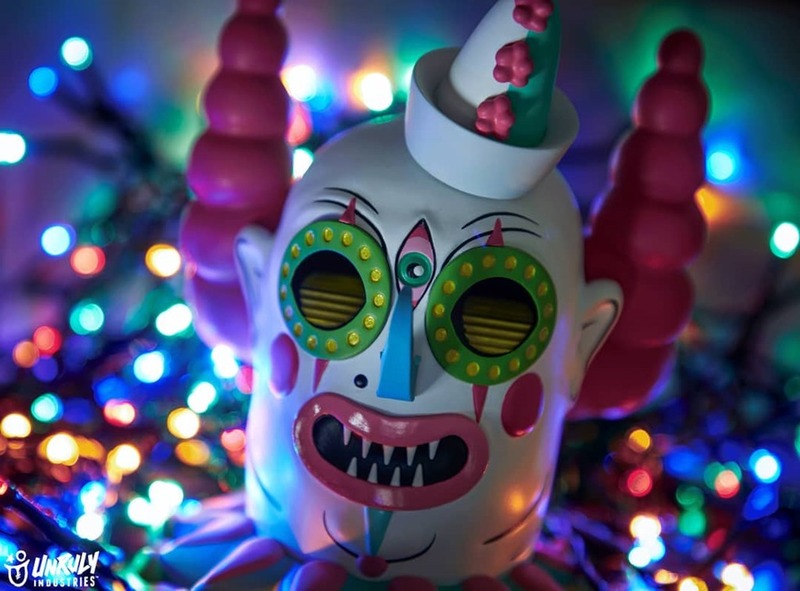 Stairway to Hell…o from Psuedo5 brings a creepy, psychedelic clown doubling as a funhouse to Unruly Industries' initial lineup of vinyl art toys. Rather than being windows to one's soul, the stairs in these clown's eyes lead to someplace dark and likely wild. The figure offers a path into Psuedo5's art which she fills with dark, fantastic images often against a bright, neon palette. Limited to 500 pieces, Stairway to Hell…o (6") is available now for pre-order at $115 each from Sideshow Collectibles. The figure should ship between July and September of this year. 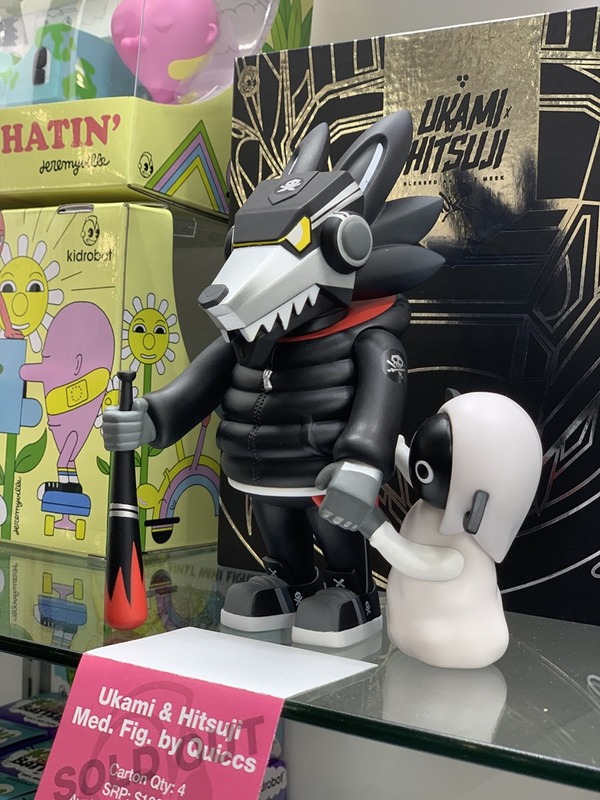 Kidrobot revealed a large number of upcoming releases at their Toy Fair booth including the Ukami and Hitsuji vinyl set from QUICCS. The set, whose name translates to Wolf and Sheep, features QUICCS' modern flip on the classic, allegorical pairing. With a robotic face, headphones, puffy jacket, and bat in-hand, Ukami delivers the futuristic street style version of the big bad wolf. Only this time the wolf turns out to be Hitsuji's (sheep) protector. This intriguing new original set is slated to drop later this month for $100 from select retailers and of course, Kidrobot.com. Alan Ng of Fools Paradise continues his series of Superhero riffs with Lowfool : Revenge. First seen in unpainted proto form at Thailand Toy Expo, Revenge offers a dramatic scene with a Super Lowfool sitting atop a vanquished Joker. Ng's Superhero takes are notable for their considerable range be it silly, clever, thoughtful, or in this case, bold and heartfelt. The Lowfool:Revenge vinyl set will be available for pre-order on 2.22 from Fools Paradise.